Street artist, self-taught, Cyril Phan, alias Kongo first became known as a tagger and graffiti artist on the urban Parisian, European and American scene. Now a major figure of graffiti art, he continues his career mainly in Europe and Asia, where he regularly exhibits in galleries and museums. He also collaborates with leading luxury brands (Hermès, Richard Mille, Pinel & Pinel, Daum) for the creation of fashion accessories, watches, trunks, shop scenography, glass sculptures. Kongo is a committed and supportive artist. He greatly contributed to the defense of graffiti as an artistic discipline. His works can be found in large private collections in Europe and Asia. Cyril Phan alias KONGO was born in Toulouse in 1969 from a french mother and a vietnamese father. From the age of 14 to 18, he lived with his mother in Brazzaville (Congo). He now shares his time between Paris, Hong Kong and Guadeloupe. Self-taught street artist, Kongo made a name for himself in the urban Parisian, European, American and Asian scene as a graffiti artist. After nearly 30 years of practice, he has become internationally recognized. Kongo is a member of the collective MAC CREW. He co-founded the Kosmopolite festival (international graffiti festival). He participated in many street art festivals, collective exhibitions in museums (such as « Tag in Grand Palais » in 2009, « Graffiti art, forty years of expressionnism » Grimaldi Forum, Monaco 2011 and « Graffiti Fine Art » MuBe in Sao Paulo in 2013), exhibitions in art galleries in Europe, America and Asia. His first solo shows were held at Galerie Matignon Jany Jansem in Paris in 2014 and 2015. In 2014 Jany Jansem co-produced with AXA Art a gigantic fresco of 37 meters long in front of AXA’s avenue Matignon office in Paris. The work remained in place until June 2015. Kongo’s art evolved from an act of passion expressed on city walls to a more thoughtful and more sophisticated writing on canvas. His expressive and colorful art tends to a calligraphic abstraction immediately recognizable. 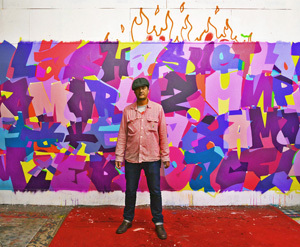 His letterings and forms blend in an elaborate visual rendering punctuated by spontaneous movement of spray. The sophistication of his artistic writing has been noticed by several luxury groups. Hermes produced for the autumn-winter collection 2011-2012 a series of luxurious scarfs based on some of Kongo’s paintings. He made the decoration of a trunk by the leather goods House Pinel & Pinel with graffiti artist Colorz. In 2015 he created glass sculptures for Daum. And in 2016, Richard Mille invited him to collaborate on the design of a limited edition luxury watch. Kongo developed original tools for this one-year, 5 square centimeters project. His work can be found in many private and public collections.